Established in December 2013, Australian Beer Company’s award-winning brewers brew quality craft beer and cider that celebrates Australian produce. Our story comes from the humble innovative origins of our home town in Yenda and our passion for celebrating Australian provenance with our brewers. 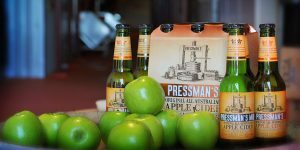 Our Pressman’s cider range is proper cider, made from 100% Goulburn Valley apples, in the proper way. Like so many other great local and independent brewers out there producing great beers, our three expert brewers are passionate about developing great tasting beers and ciders for your journey of beautiful beer discovery.